The Radion G4 LED will be the successor to the third generation Radion LED light from Ecotech Marine. The Radion G3 Pro LED has easily been one of the most popular full-fledged reef aquarium LED lights in recent years and since it’s been well over two years since its introduction, you can count on the Radion G4 being announced and released some time soon. When the Radion was first released by Ecotech Marine, it was updated on an almost annual basis with new generations that brought with them more channels and a different assortment of LED colors. In the intervening time since the last Radion G3 LED was announced, Ecotech has been hard at work improving the performance of their flagship light, and one of the biggest new changes will be a completely new type of LED lens cluster. The radical new lens system in the forthcoming Radion G4 LED is called Hemispherical Edge Illumination, or HEI for short. 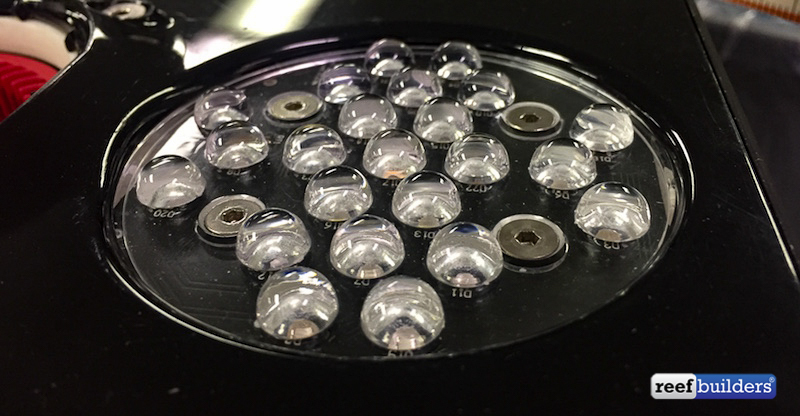 The HEI lenses look like little half-spheres placed on top of the LED’s primary lens, and it is also a form of total internal reflection lens or TIR. However the big breakthrough with HEI lenses is a nearly perfect light intensity distribution leading to a much more uniform light field across the light spread. So now instead of having a hotspot in our tanks with peak PAR that drops off dramatically away from the center of the tank, the HEI lenses of the Radion G4 will produce lower peak PAR values but more overall light throughout the tank. The new HEI lens cluster of the forthcoming Radion G4 LED light from Ecotech Marine. We’ve got a sneak peek at the new HEI lenses of the Radion G4 LED light and it’s clear to see that this is a very different optic from the TIR lenses of current generation Radion lights, and virtually all LEDs currently on the market. As far as we know only the Current USA Orbit Marine Pro has such bulbous LED lenses which we have previously praised for having a much more uniform light output. We can also see that the new HEI lens cluster of the Radion G4 LED will have 23 LEDs per puck, compared to the 21 currently in the Radion G3 Pro – we presume that the Radion G4 Pro will have all of these lenses populated with diodes for a total of 46 per fixture, with a few less in the base model of the Radion G3 LED light. There’s still no official word from Ecotech Marine about the next generation Radion G4 LED light but with MACNA just around the corner, we expect some kind of announcement leading up to the this all important reef aquarium conference.